This juicy hunk of printed circuits is an open source controller for the peripherals of an electric car. It’s the product of a capstone project working on a vehicle aimed at urban commuting. There wasn’t a suitable non-proprietary module for controlling a car’s peripherals so the team built their own. As far as we can tell this is not responsible for driving the vehicle itself. We assume there’s another piece of hardware which reads from the accelerator pedal, drives the motors accordingly, and handles things like regenerative braking. But there’s a lot of other things in a modern vehicle that need to be taken care of as well. Head, tail, and turn indicator lights must be switched. All of the dashboard controls (like the turn signal lever and the wiper blade speed settings) need to be monitored. Something needs to drive the door locks, and a system that reads the door ajar sensors and switches the dome light on and off must be handled. This is where the controller pictured above really shines. The team has released all of the hardware information. The code is not yet available, but will be as soon as they’ve cleaned it up enough to package the first release candidate. This super quick hack will be fun to do with the kids. Remember the days of View-Masters? You’d put a disk of small slides into a little plastic viewer and a stereoscopic image would jump out at you in 3D! Now you can not only view stereoscopic images on your smartphone, but make your own too! To shoot the images just hold your phone in portrait orientation and take a snapshot of your subject, then move the camera six inches to the right and take a second image. The two pics need to be displayed on the screen at the same time and for this [Plarky] uses a free iPhone app called Pic Stitch. We’re sure you can find an Android equivalent in no time if you do a bit of searching. To view the stereoscope it helps to make a divider out of cardboard like the one seen above. You’ll need to cross your eyes and focus on a point to bring the two images together. We don’t remember having to do this with the View-Master so we’re hoping someone will take the idea and improve upon it. We’ve already seen a digital View-Master. Now we want to see those dual screens replaced with an iPhone cradle. This soldering nightmare is a configurable RFID tag which has been built from 7400-series logic chips. The beast of a project results in an iPhone-sized module which can be used as your new access card for security systems that uses the 125 kHz tags. The best part is that a series of switches makes the tag hand programmable, albeit in binary. Of course this is an entry in this year’s 7400 Logic Competition. It’s from last year’s winner, and he’s spent a lot of time documenting the project; which we love. We were surprised that this many chips can be powered simply by what is induced in the coil from the reader. This is just one of the reasons the 7400-series have been so popular over the years. After working out the numbers, a 64-bit shift register was built to feed the tag ID to the encoding portion of the design. There were many kinks to work out along the way, but once it was functional a surface-mount design was put together resulting in the final product shown off in the video after the break. We’d bet everyone reading this article has played a game on an emulator at some time or another. And you may have a base idea of how those emulators work. But we’d wager the vast majority of you are clueless about the actual implementation of game emulators (we know we are). But that has all changed after seeing this demonstration of how [Bisqwit] wrote his own NES emulator. The description doesn’t cover anything more than the basics of writing code that emulates the NES CPU hardware itself. But it’s presented in such a way that makes it quite easy to understand for anyone who has a basic knowledge of programming. He starts with a switch statement for handling the processor’s opcodes and then moves through piece by piece showing how he refined his code to make it work while keeping it readable. We think this is a great teaching method and appreciate the time he put into producing this tutorial. The explanation starts about 4:22 into the video which is embedded after the break. You’ll also find the first two demo videos there. Those involve mostly fast-motion text editing of the emulator coding process with some gameplay tests at the end of the second video. If you’ve ever played with a turntable, you’ll know playing a 33 RPM record at 45 or 78 RPM turns your treasured copy of Dark Side of the Moon into a lighthearted aural experience with a pitch that is much too high. Likewise, playing a single at 33 or 16 RPM means those once dulcet tones are now recordings of tormented souls in an acoustic hell. [Phil]’s voice changer operates on the same principle by recording sounds from a microphone into a circular array and playing them back at a different rate; faster if the desired effect is a Munchkin, and slower if this year’s Halloween costume will be a Sith lord. The completed build incorporates a 10k pot to dynamically change the timbre of the voice changer, as well as an Adafruit Wave Shield to play back a few pre-recorded sounds of lightsabers clashing. In all, a very cool project for your Halloween costume that’s also a very good introduction to DSP and real-time audio modifications with a microcontroller. Even though the world of software defined radio started out as a Linux-only endeavor, several recent software releases have put the ball fully into the court of OS X users. 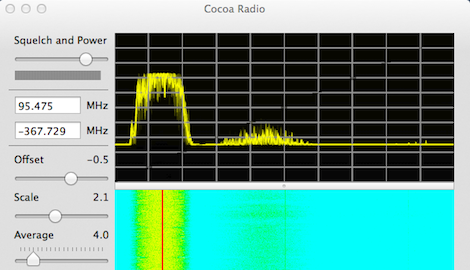 [hpux735]’s new Cocoa Radio release provides a (nearly) fully functional software defined radio for anyone with a USB TV tuner and a mac. Earlier this week, we saw (and tested) [Elias]‘ port of gqrx and were reasonably impressed. [hpux735]’s app does the same job and also provides the source so you can compile it yourself. Previously, [hpux735] ported the osmocom driver for these RTL2832U-based USB TV tuner dongles to the Mac and wrote a small Cocoa driver. The new Cocoa Radio software uses this driver and adds all the features you’d expect from a software radio package; in the title pic for this post, you can see a top 40 radio station near my house and their insipid hatred of dynamic range. [hpux735] posted a few videos of his development process. You can check those out after the break.